This tofu puff tart was a great success. I’m very happy. Tofu (soya bean curd) has so many health benefits as I wrote before (Tofu Balls Recipe), it’s good for making clear skin, weight control and aid against heart diseases etc. I try to use these kind of nutritious ingredients for daily cooking in a natural way. I don’t think I’m health-conscious person. I love chocolate, biscuit and crisps etc., they are great! But, maybe my basic idea of ‘eating food’ is still very Japanese. In Japan, “what is good things me to eat” is most important for everyday meals, because we believe that healthy food is also the most natural medicine, and the relationship between food, good health, nature and remedy is woven into our culture and life-style. Anyway, we need to eat everyday to live, so, taking healthy ingredients without hard work is a good idea. And, sometimes need to eat chocolate cakes for pleasure too! Place the drained tofu in a bowl and mash, add the chopped fresh thyme, minced garlic, salt and black pepper, mix everything together. Cut the ready-rolled puff pastry approximately 11 inch x 7 inch and place the pastry on a baking sheet. Crumble the feta cheese over the tofu mixture, arrange the cherry tomatoes and black olives on top. Drizzle some olive oil on the cherry tomatoes. Bake in a preheated 190C/375F oven for 25-30 minutes until the pastry in crisp and golden. 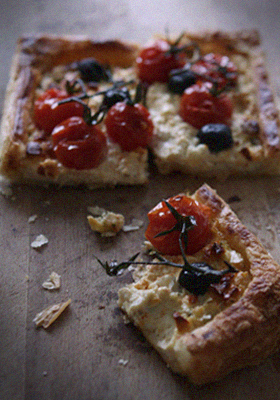 § 2 Responses to Tofu, Feta & Cherry Tomato Puff Tart"
Making this asap…diabetic, but may try it for me with something other than puff pastry, but this for the family; thank you…yum!!!! You are currently reading Tofu, Feta & Cherry Tomato Puff Tart at Fish Trip Cafe.